Need to get rid of Webbing Clothes Moths? What is a Webbing Clothes Moth? The Webbing Clothes Moth is a worldwide pest. They are the most common clothing moth in the United States. 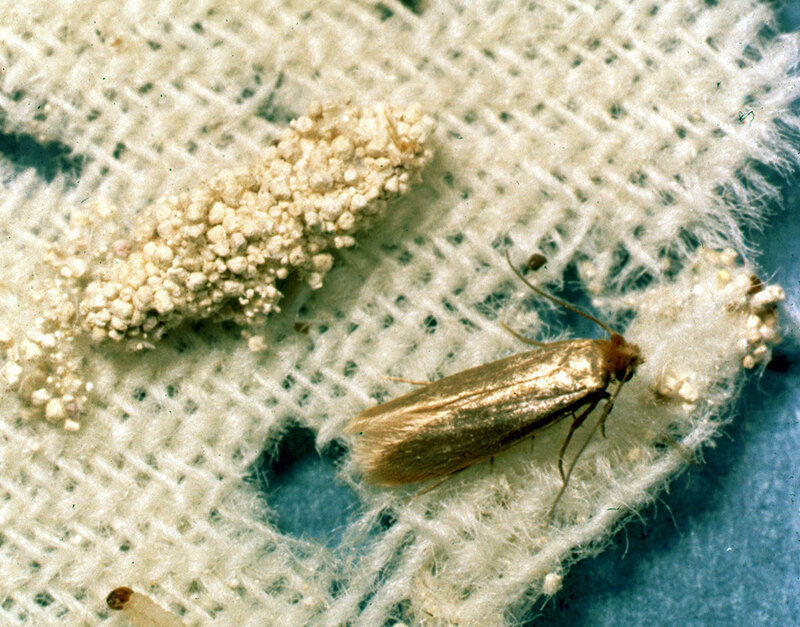 Webbing Clothes Moths cause damage in museums, drapery and rug shops. The Webbing Clothes Moth adult has a body covered with shiny golden scales and the top of its head looks fluffy with reddish golden hairs. Its eyes are black and antennae are darker than the rest of the body. There are no spots on its wings and them about ½ inch. When this moth does fly it likes darker areas of a room. The larvae are shiny and greasy in appearance. They have three pairs of joined legs and four pairs of prolegs and the abdominal segments. Their mouth parts are made for biting food and spinning silk. Emerging larvae feed almost immediately. It typically bites off a fiber, chews on it and moves to the next fiber. The result of this feeding is damaged fibers. Larvae can feed on carpet. Webbing beneath the carpet indicates the presence of the larvae. How to get rid of Webbing Clothes Moths? With these kinds of pests, Integrated Pest Management is important to locate the moth. Inspection, monitoring, sanitation measures, storage recommendations, quarantine recommendations, non-pesticide techniques as well as pesticide tools must be considered. The first step would be inspection of possible infested items. It might be appropriate to discard the affected item. Vacuum cleaners are important prevention tools along with dry cleaning of affected items. The use of pheromone traps could be appropriate. Cedar products are another possible approach for management. If you suspect that you have a Webbing Clothes Moth problem and want additional information, please call our office for prevention and treatment options.